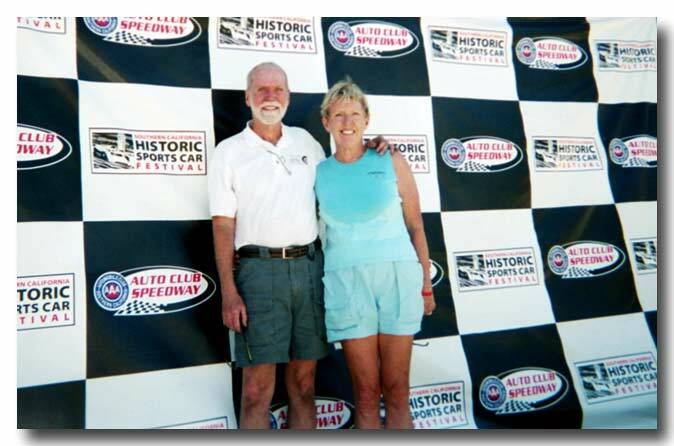 We raced on the west coast (Thunderhill) attending a Titan/Winkelmann race reunion. Several Denver FF drivers attended including Jamie & Carol Stiehr, Mike Ries, Diane & I. Here's a link to full coverage of that event on Andy Antipas's Titan website. 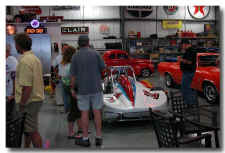 After attending that race, on the way home we stopped in Gateway, CO to see the amazing Gateway Canyon Resort and Car Museum. 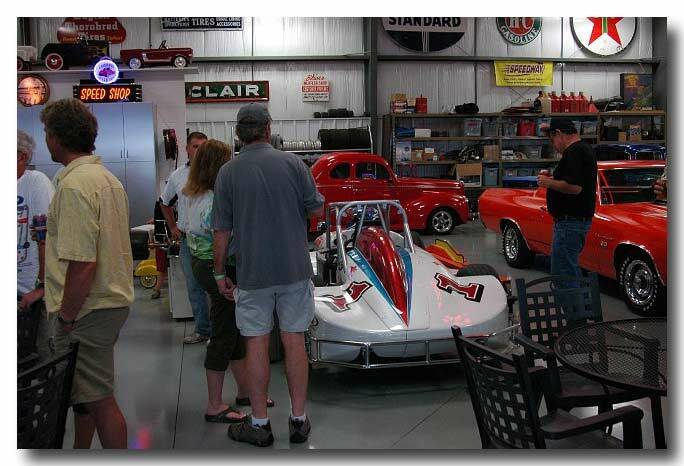 World class facility, world class cars, and a "Don't miss" stop for any car enthusiast. Pictures of that side-trip are here on our SmugMug site. 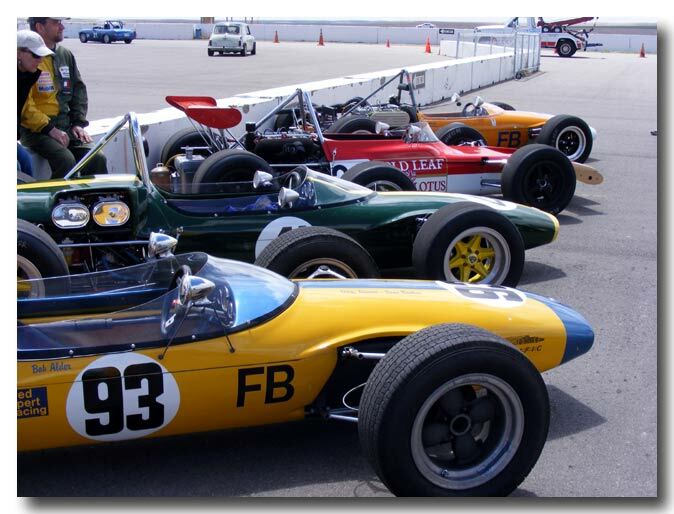 A bunch of RMVR Formula Ford racers decided to get an early start on the 2017 season by attending a VARA race in Nevada. 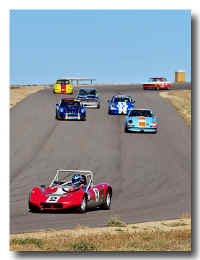 It was held at a private Country Club Racing facility, Spring Mountain Motor Racing & Country Club. It's located about 45 minutes west of Las Vegas and is, in fact, a county club facility. Good news. No damn golf course. Just an amazing track and facility. 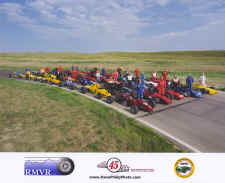 Eleven FF racers from RMVR attended. The Good News: It was a great facility and trace track. The Bad News: The weather was bad, with rain Friday morning and much of Saturday. But the track was dry on Sunday so eventually we got in some good laps. 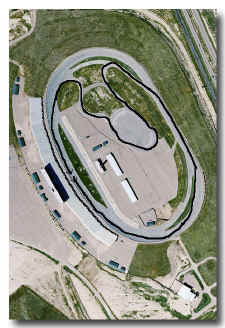 The track has multiple configurations. We ran one of the longer configurations, the Mansell course -- 3.4 miles with 18 corners. 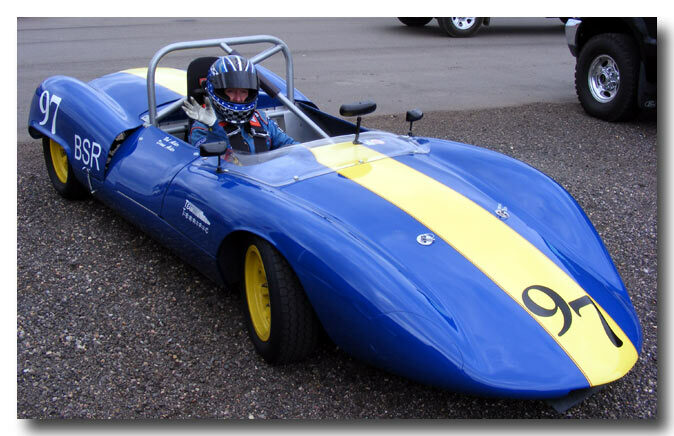 Learning it with limited track time and usually wet conditions was, to say the least, a challenge! Top left, Bob leading (or holding up, hard to tell) a pack of FFs. Top right, five of the RMVR "dudes" -- Pete Christensen, Steve Barkley, me, Matt Ammer, and Bob Hancock. Mike Ries was missing at that time. 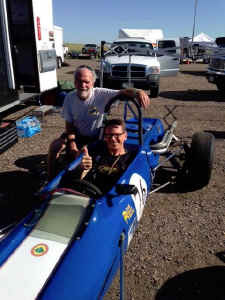 Other RMVR FF racers who made the trip were Ron Hornig, Pete Sabeth, Bill Demetre. 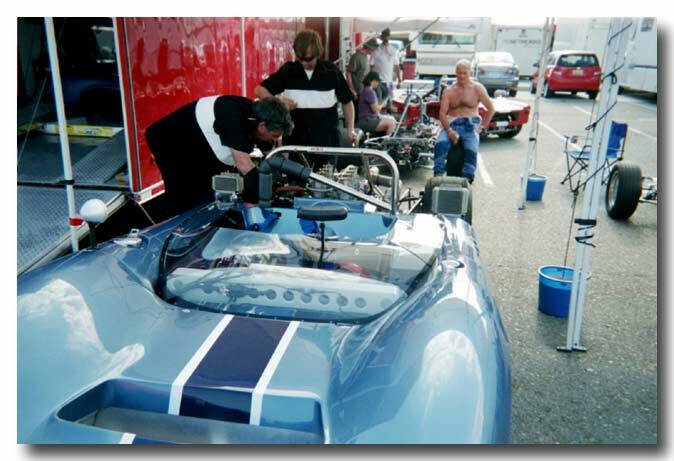 Plus Charlie Daniels & David Lawrence (both from Albuquerque, the southern contingent of RMVR FF racers). 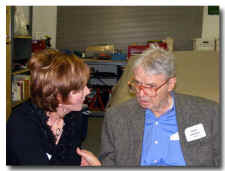 Unfortunately John Mihalich, Jim Stienmetz, and John Lewinger were all supposed to be there, but had to cancel. 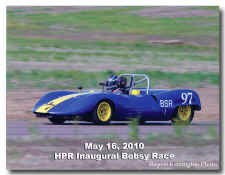 Randy Pobst is a professional race driver. He was kind enough to lend his celebrity status to RMVR's annual charity event in Aug. of 2015, helping us raise money in several ways. 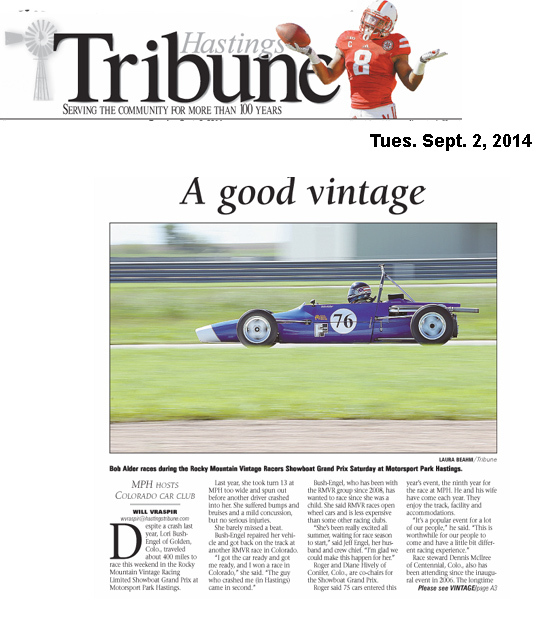 I was privileged to let him drive my Titan Formula Ford for the weekend. He drove it all weekend, but on Sunday's last race I got back in the car. It's amazing (Nay, very humbling) to realize what a pro can do. 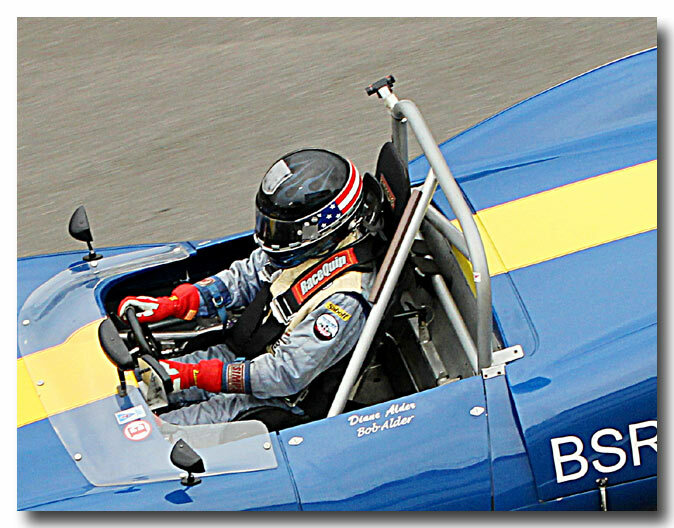 Randy hasn't ever really raced an open wheel car, his professional career being in sedans. 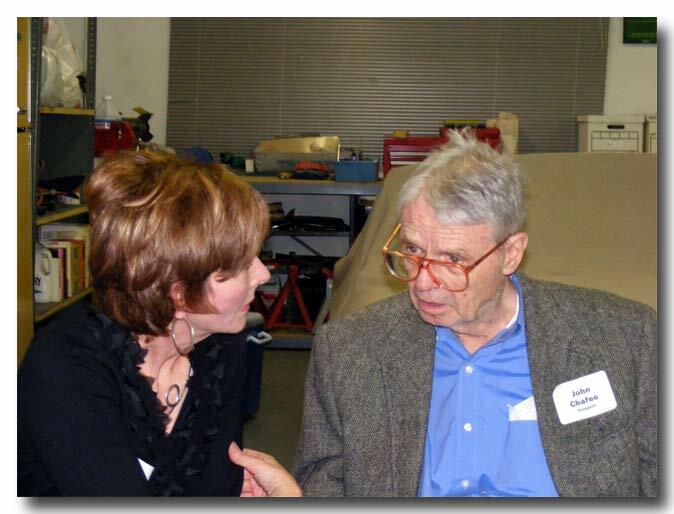 He had only driven an open wheel car once many years ago (like 20+ years ago!). He was turning laps in a my car almost 2 seconds per lap faster then me. I'd kill for another 1/2 second per lap. So, lesson learned. . Fortunately I had the data recorder going all weekend so analyzing his laps vs. mine was extremely educational. Let's just say, I have a long way to go but the data says it can be done. Randy is a true gentlemen and a pleasure to "hang with." Thanks, Randy. 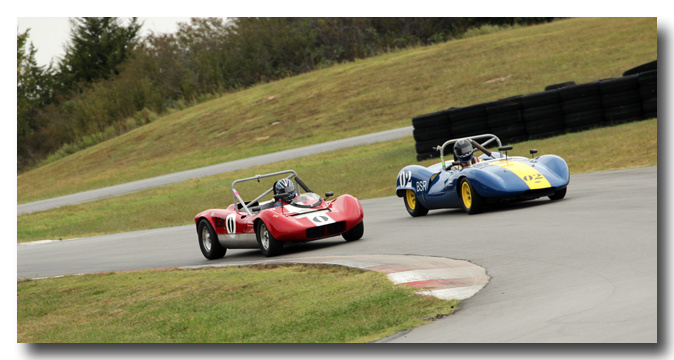 Also, this particular track photographer takes video and was able to get some neat footage of us together on track. Below it a short video, less than 4 minutes. Note in the last 20 seconds of the video ugly smoke coming from the right rear Diane's wheel well.. It turns out it was in the process of cutting down the right rear tire due to a broken shock absorber mounting bolt. Half a lap later the tire came apart and she went for bit of a ride in a very fast left hand sweeper. Happily no real damage beyond a shredded tire. Anyway, it was the last session of the weekend and the last lap of the race. So she didn't miss much racing. Now that I'm a video expert (ha-ha) here's a video of one of my races in the Titan FF where there was some good action, both good and bad. It is a 14 minute video, but it's interesting to watch the embedded info from our onboard data acquisition system -- Speedometer & Tachometer at top, where the car is located on the track (Lower Right), and the G-Forces (Lower Left). Also, there's some captions within the video explaining events. Lap number one has some excitement which I avoided. 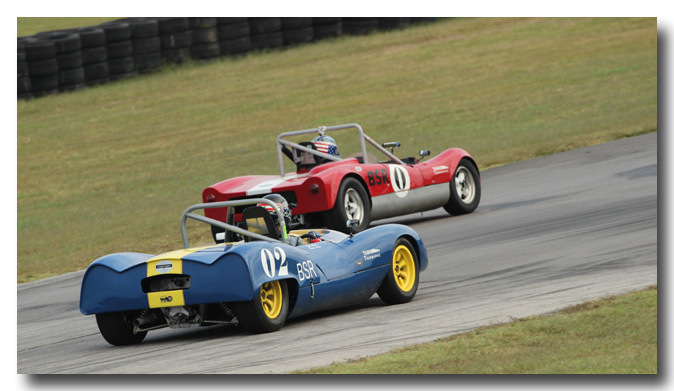 Then Jim Steinmetz and I raced back and forth all race, until I screwed up on the last lap. Arrrrrgh! 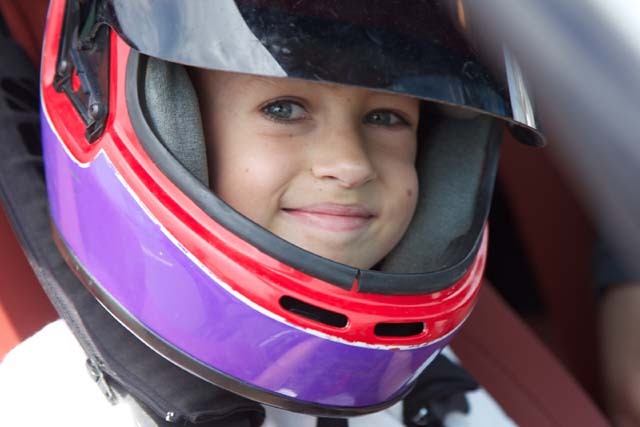 RMVR’s Third Annual Race Against Kids’ Cancer was another resounding success! Once again the charitable beneficiary was the Morgan Adams Foundation (MAF) which sponsors research into causes and cures for cancer in children. 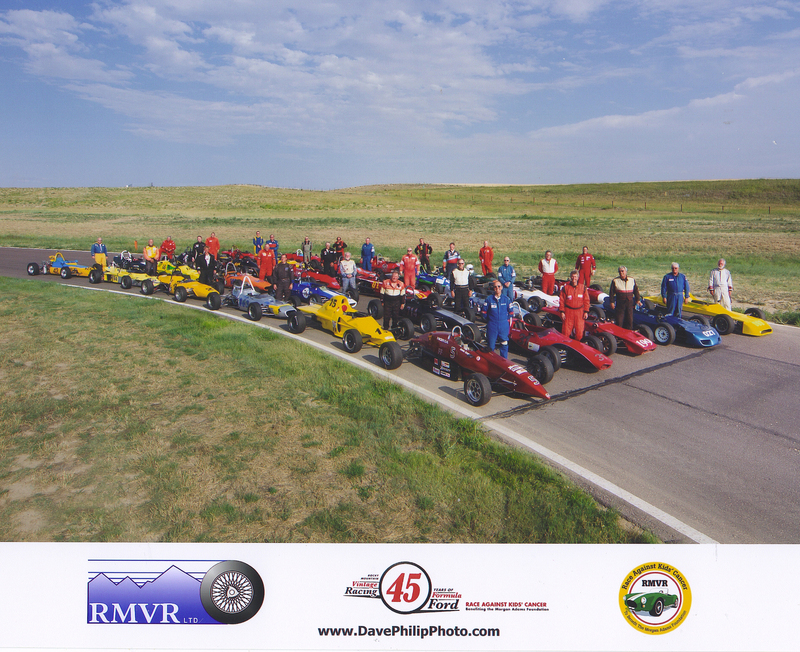 The July 27-28 race weekend at High Plains Raceway brought in about $75,000 for the third year in a row, bring the three-year total raised for MAF to about $225,000! Not to mention giving some “Kids” a great weekend. 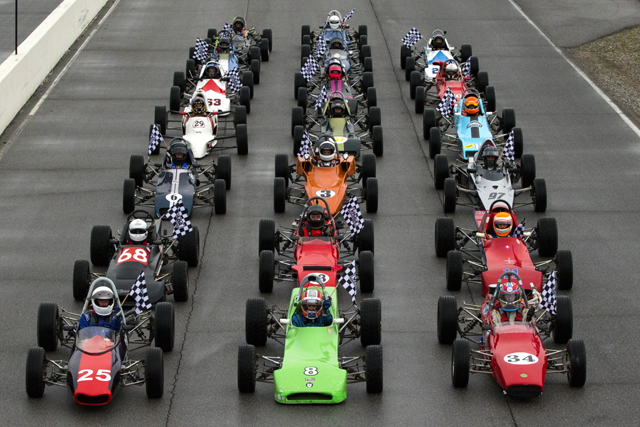 An added attraction to this year’s charity race weekend was a Celebration of 45 Years of Formula Ford. To genuinely reflect the full history of this great formula, RMVR invited all Formula Fords, even contemporary versions. The turnout was great with 39 FFs entered for the event coming from surrounding states of New Mexico , Utah , Minnesota , and Nebraska . This represented the largest ever FF grid in the Rocky Mountain region, even bigger than back in the day of FF in the 70s. Very impressive and great fun. 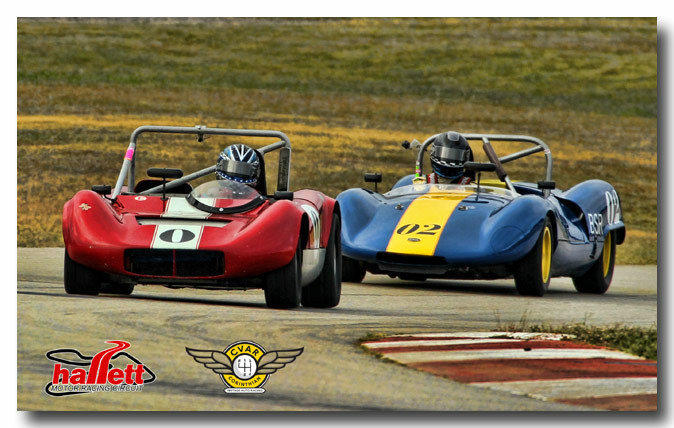 One of our RMVR members and FF drivers, Steve Urbano, created the concept and graphic design for this sensational poster for the weekend's feature, 45 years of Formula Ford. The Dave Philip Photography was kind enough to take and create this wonderful FF Group Picture. 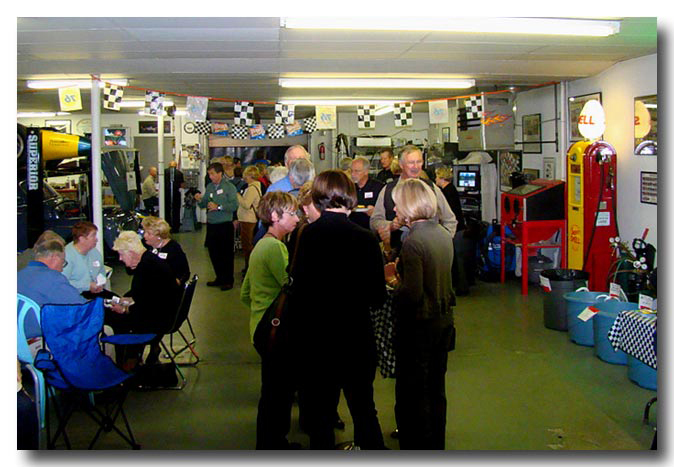 During an extended lunch hour on both Saturday and Sunday donors could purchase a “Ticket To Ride” at speed for three laps in some spectacular race and exotic machines. 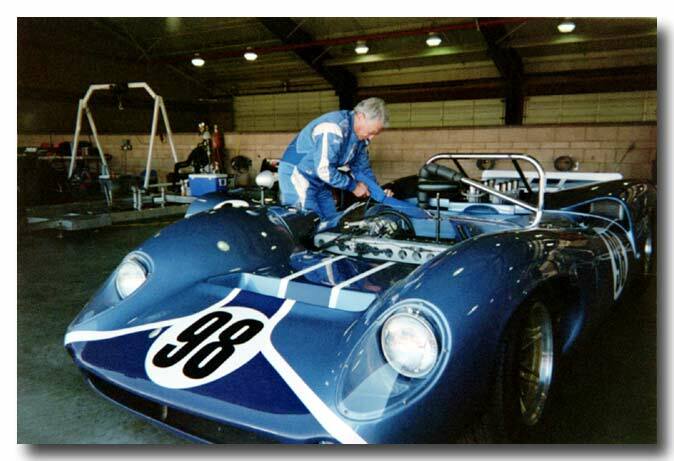 Imagine the thrill of getting a ride a genuine Penske/Donohue Lola T-70. That was an easy sell! Rides in a new Lamborghini or Aston Martin Vantage, the N24 Factory Racing version, were also sold out. Who could resist those rides? 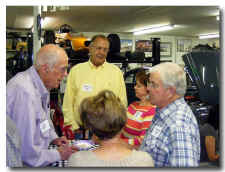 RMVR corner workers gave up their lunch hour to assist donors with helmet fittings and getting donors into and out of cars for a ride of a lifetime. 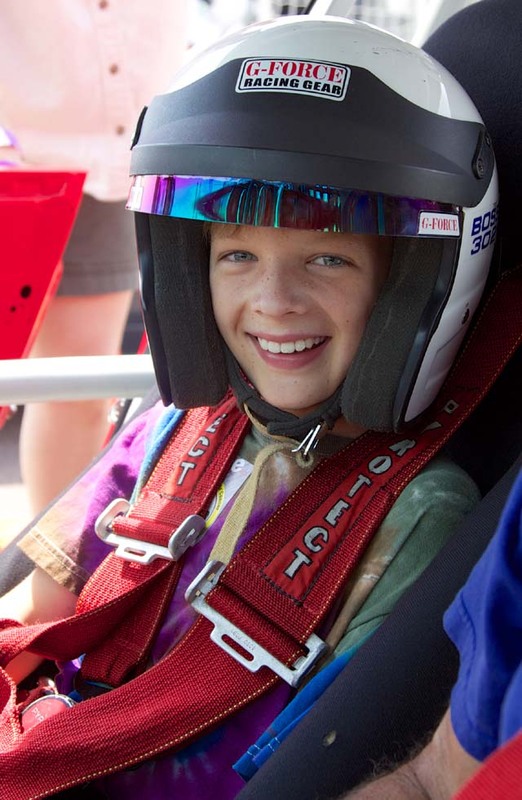 While generous donors purchased a lot of rides of a lifetime, our drivers also treated some of the kids undergoing cancer treatment a ride which no doubt they will always remember. 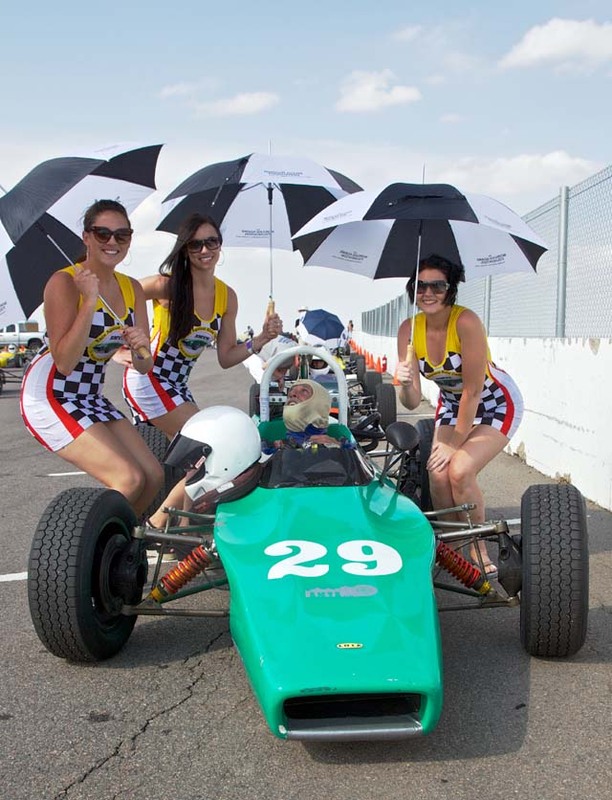 A fun new fund raising twist this year was the availability of some very foxy Umbrella Girls to shade for drivers on the pre-grid before each race, all in the name of charity of course. For a $20 donation one of the very attractive ladies would provide shade, a picture was taken and a wallet sized print provided. Guess what? Umbrella Girls sold out and it wasn’t even all that hot (the weather, that is). Imagine that. Above is the cover of a very neat 2014 Calendar featuring 12 difference exotic cars and, dare I say, 12 exotic Grid Girls, These calendar's are now available directly from MAF ($20). Just CLICK HERE. You'll support MAF and love the calendar. 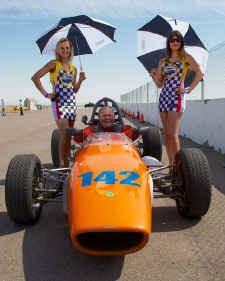 These three pics of Grid Girls at work raising money for MAF were also taken by John Waugh. 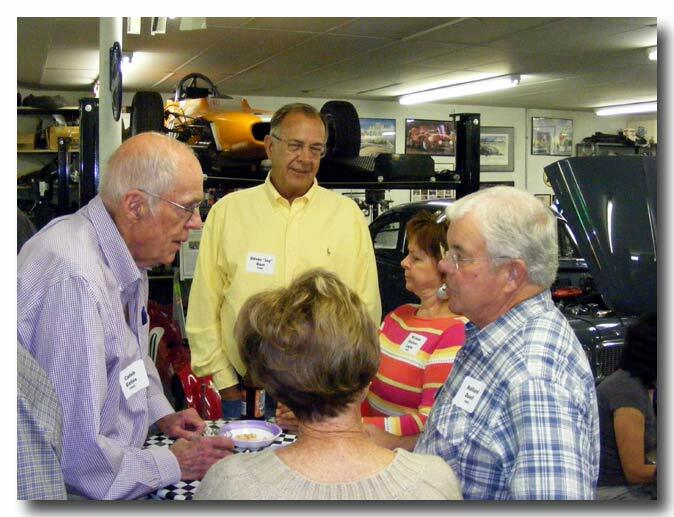 Left to right Jimmy Steinmetz, Chris Thompson, and Bob Darcey. All this combined for a great RMVR weekend. 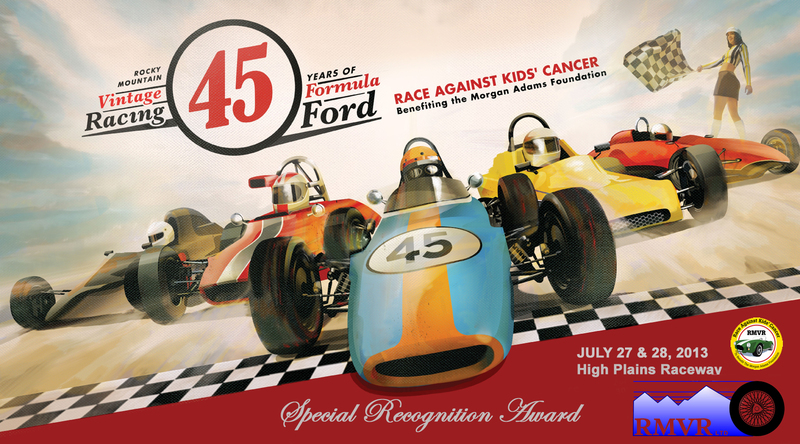 Good racing, lots of fun and all done to benefit a great outfit, the Morgan Adams Foundation. 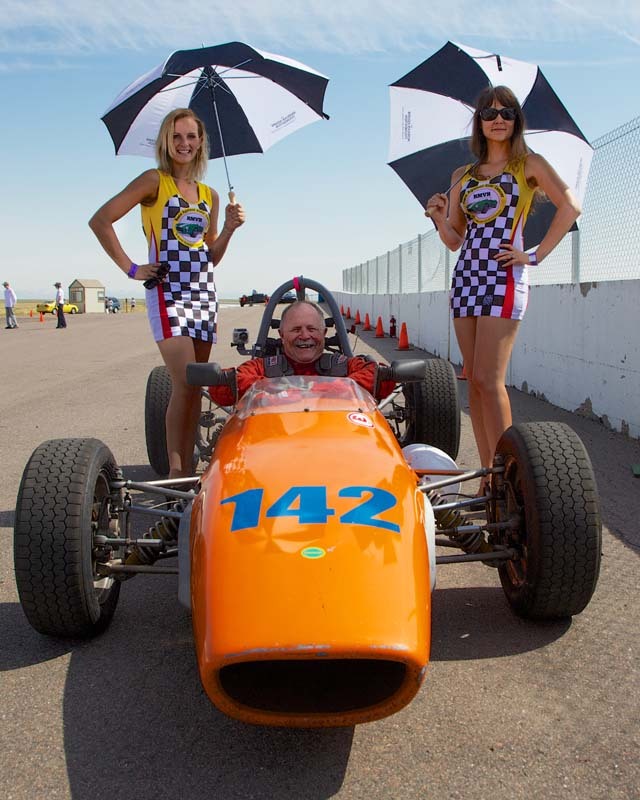 Our last race of the season at Pikes Peak International Raceway (PPIR). These two nice pic of Diane getting ready to go out. She finished the year on a high note, winning one race on Saturday and then on Sunday, after starting 10th came in 3rd and set the fastest lap against the Formula Fords and Formula Vees, not to mention a personal best lap time at PPIR by a couple of seconds! 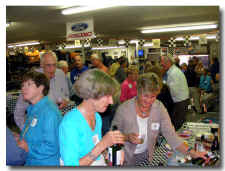 A really nice way to end the season..
September 17, 2011 - After fiddling for a long time with the idea of a reunion party for all the fine folks I worked with over the years, we decided to throw a big party. Having been retired from Tempest since the end of 2002 (It doesn't seem possible! ), it took some effort to assemble contact information for everyone. But that in itself was a fun task. There were folks from the old FNBD days ('69-'74), the CNB and CCA tenure ('75-'92), as well as compatriots from Tempest ('93-2002). The party was grand fun. 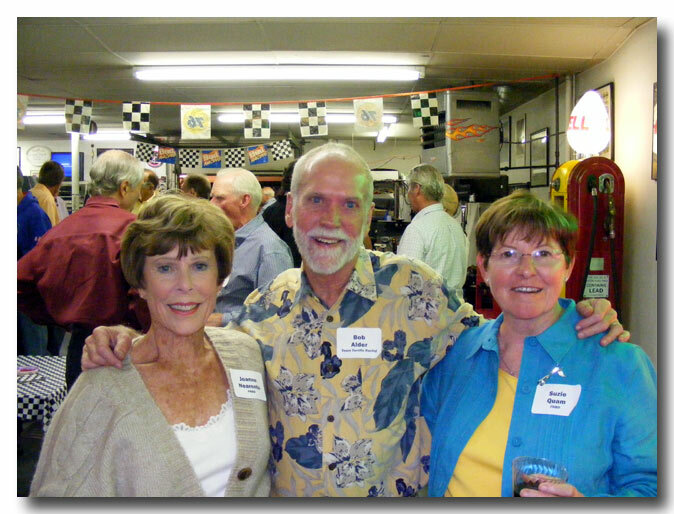 Many folks attending hadn't seen each other in 20+ years. How very cool. 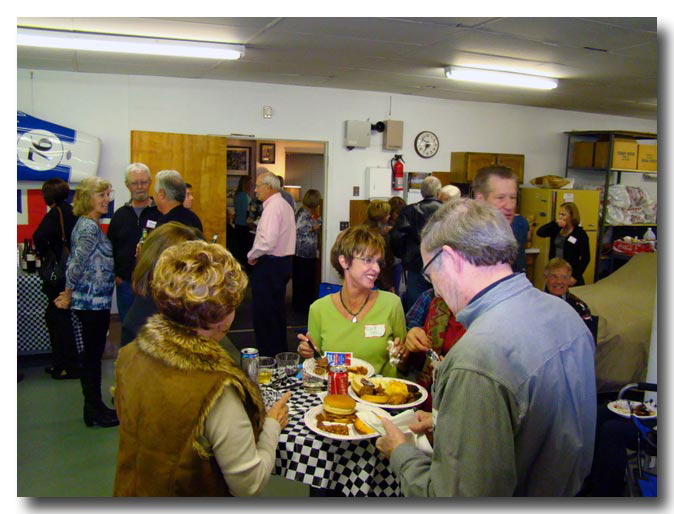 Many thanks to all who were able to attend. I can't tell you what a treat it was to see everyone. Below are just some teaser photos. For compete pictorial coverage visit the Reunion's SmugMug Picture Gallery. RMVR's "Race Against Kids' Cancer"
This year RMVR revived a charity event, this year to benefit the Morgan Adams Foundation which is devoted to funding research into cancer in children. 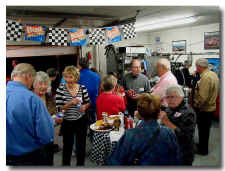 The event was a big success with 140 race car entrants, lots of spectators, and raising about $75,000 for the charity. Fantastic! 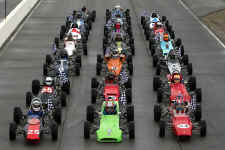 Also the race weekend saw a special grid exclusively for Formula B and Formula C cars. The special feature grid and race was organized by one of our members, David Irwin. Seldom is there such a large grid of these very unique cars, pictured at left. 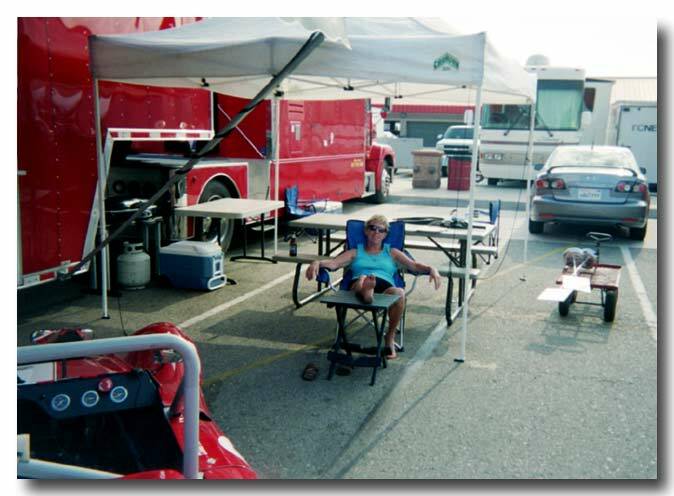 I was able to enter my Russell-Alexis FB car (Yellow car in second row). Group picture on left by Rupert Berrington, photo on right by Dave Philips. 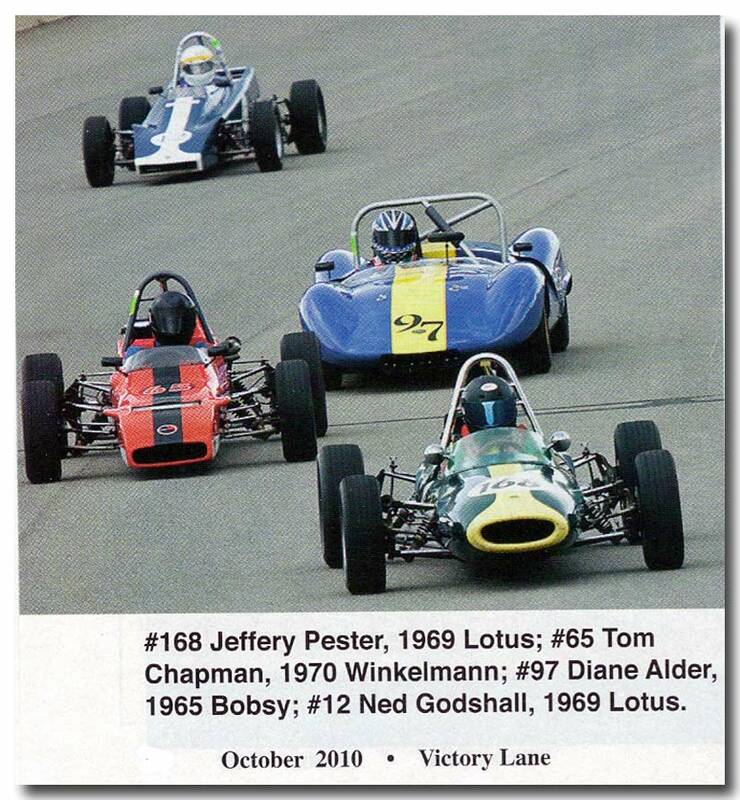 At right is a neat shot of myself in the Russell-Alexis leading good friend Andy Antipas in his historically significant Titan MK3A, a factory team car in Formula 3 trim. Diane's Birthday Party - What a blast! 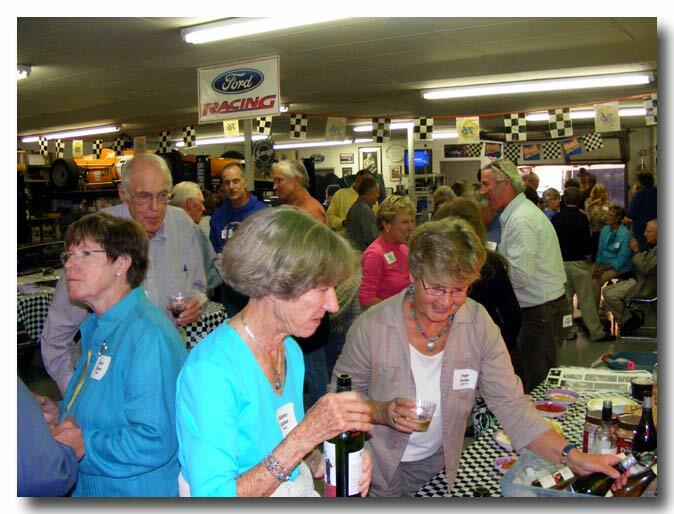 Nov. 6, 2010 - We decided to have a big party at the World Headquarters of TEAM TERRIFIC RACING to celebrate Diane's Birthday. It was a grand evening with over 100 wonderful friends being able to attend. 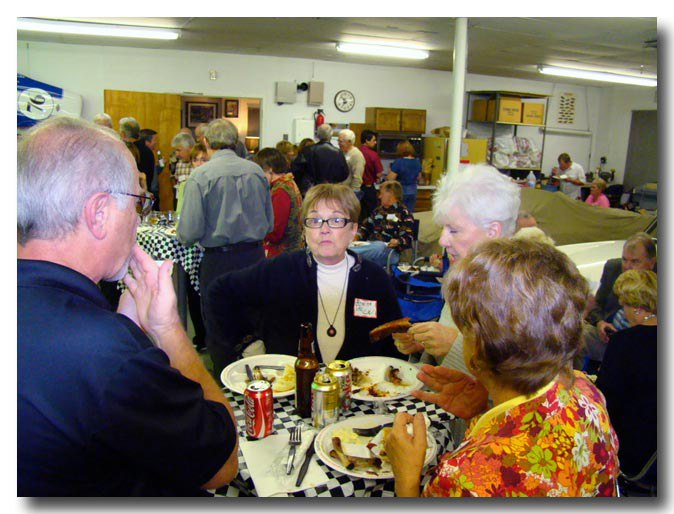 Many thanks to Bob Johnson, Coke Governski, Rose Cook, Judy Seman, and Elaine Johnson (Diane's sister) for all the great pictures. Below are a few of the pictures. Our SmugMug site has the full complement of photos complete with snappy captions. Check it out! This is just a teaser! CLICK HERE for all the photo coverage of the party. Late Oct., 2010 - To protect the name of the guilty, we attend a great party for a friend, who will remain nameless. He celebrated his 70th birthday in a rather unusual fashion. His party was entitled "70 On 70" if you view the video, you'll see why. Very cool. 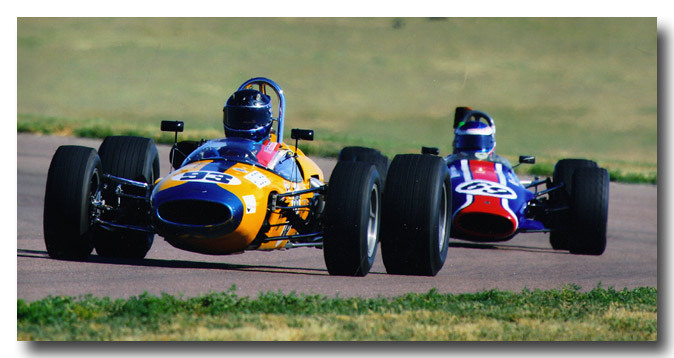 If you click on the picture at left to enlarge, you'll note a very fast formula car. 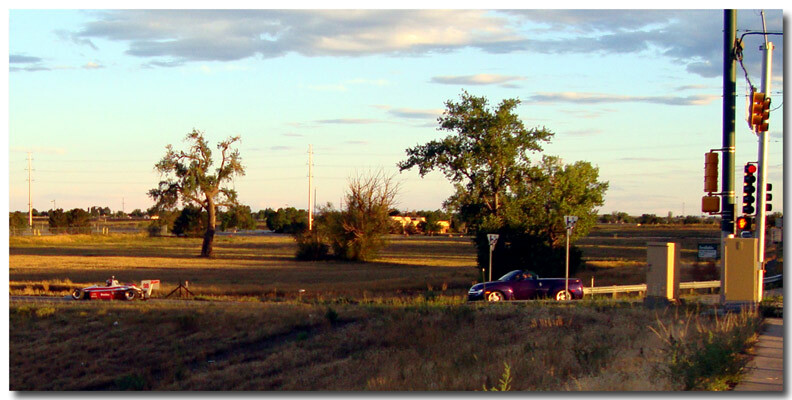 This is the on-ramp to an Interstate Highway (Location also anonymous for obvious reasons). Yup!!!!! He took a high speed run on the Interstate to celebrate turning 70! For a 14 minute full video of the amazing event CLICK HERE. We took the Bobsy and the Alexis. Unfortunately the Alexis broke during the first session on Friday. There were some off-and-on issues with the Bobsy, but nothing serious that we couldn't fix. 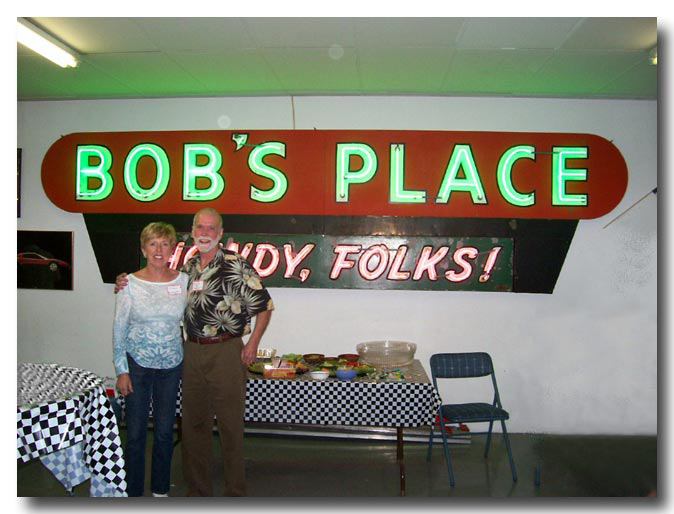 Diane took pity on Bob and let him race it Sat. morning. Then on Sunday she delivered a faster lap (by .7 second!!!) than Bob. 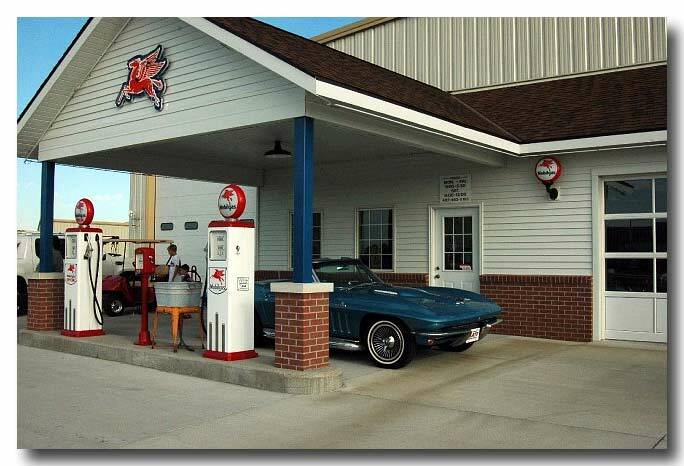 All the following pictures are complements of Don Suiter, a regular RMVR corner worker. 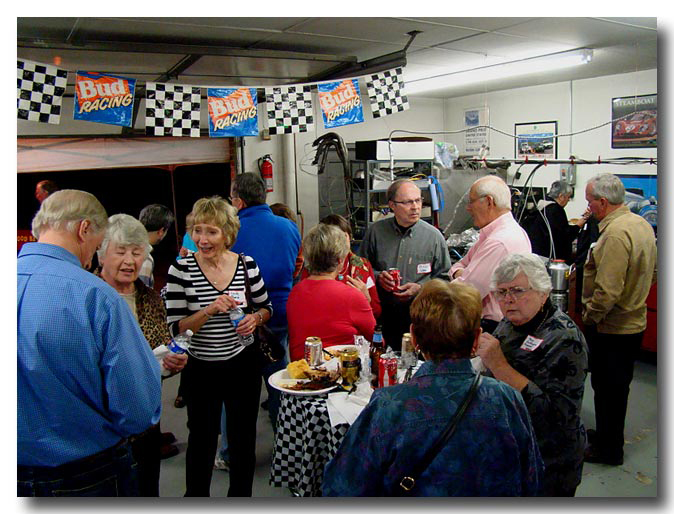 A highlight of the weekend was Sunday evening when one of the track condominium residents, Terry Klatt, opened up his amazing museum which is right at the track. The front entrance is designed like an old filling station. His incredible collection of cars, memorabilia, signage, car models, gas pumps, etc., etc., etc. 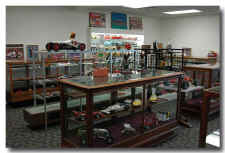 is one of the great collections we've had the privilege of seeing. These pics don't begin to do the collection justice. And in the huge building, behind the collection is a 3-story condominium beyond compare with a view of the entire race track. 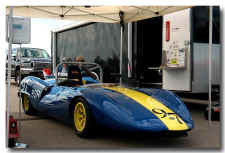 July 17-18, 2010 - RMVR returned to Pikes Peak International Raceway after not racing there in 2009. 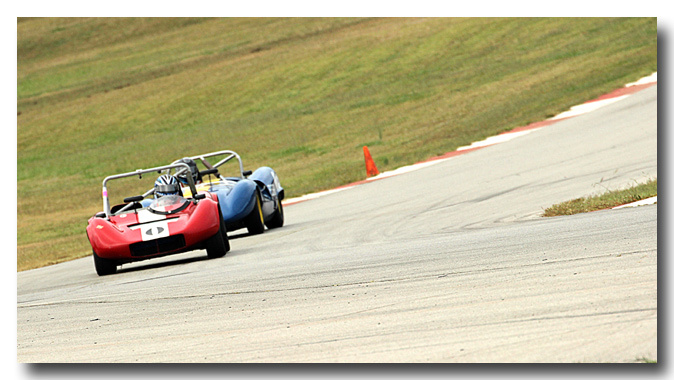 The configuration was changed so that the race was run on about 2/3rds of the oval, then coming down into the infield part of the road course, then back out onto the oval. (Click aerial map to see actual course we ran) . Actually quite fun to run the entire south end of the oval. The weather was quite hot, 100 degrees, but all-in-all it was quite bearable. 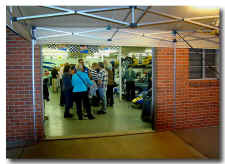 We rented garage space so weren't in the sun and also used our water mister which was a real hit. 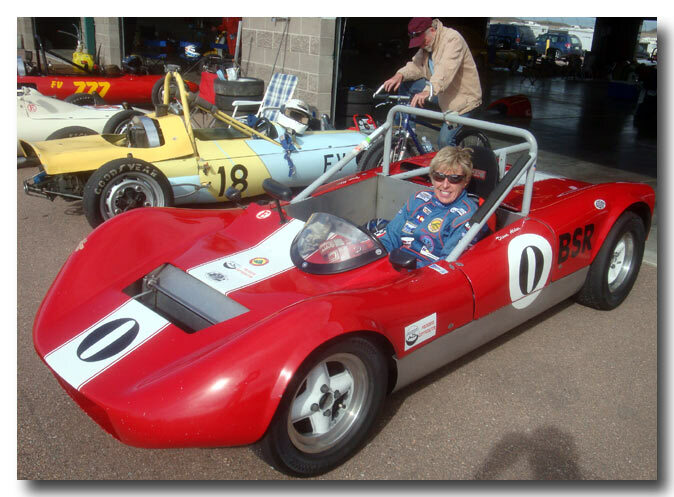 Also this weekend the sports racers, and thus Diane in the Bobsy, ran in the same run session as the formula fords (Bob's car this weekend). So, we were in the same run session all weekend, something we seldom get to do. 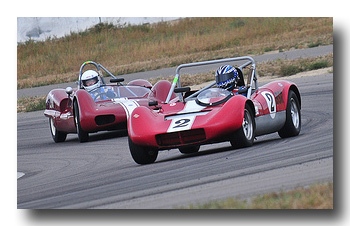 The picture below shows us both on track, on the front straight of the banking. Cool. Diane was ahead at that point, but not for long. 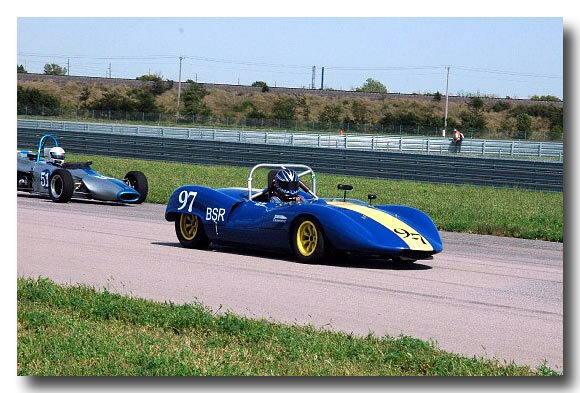 Bob had the fastest Formula Ford lap for the weekend. 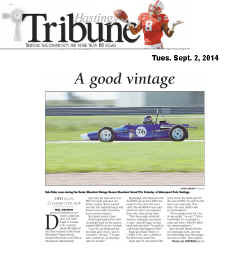 Thanks to Steve Nelson and Mike Rogers for this photo and article published in Victory Lane (click to enlarge). May 15-16, 2010 - This weekend was a bit special. 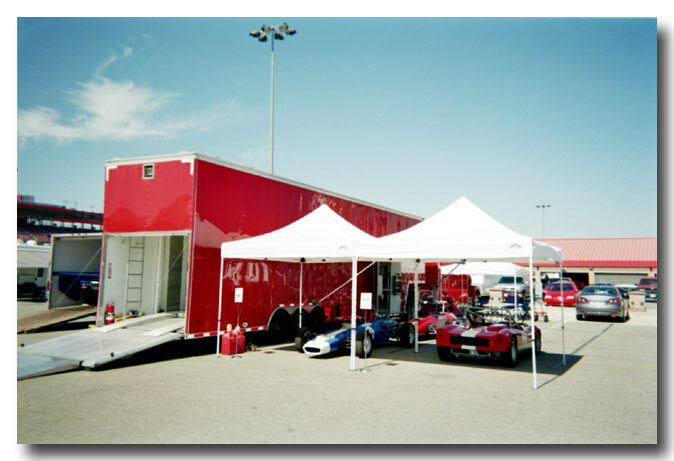 Team Terrific fielded two "new" cars. 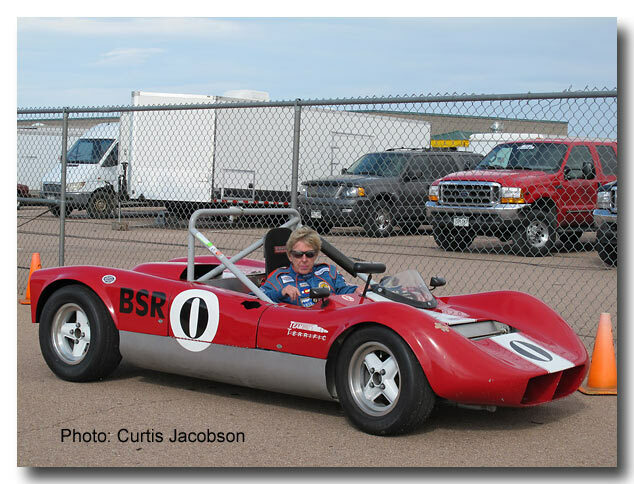 First and foremost, the Bobsy made its Inaugural race weekend with Diane driving the car. It performed splendidly and she REALLY liked it. 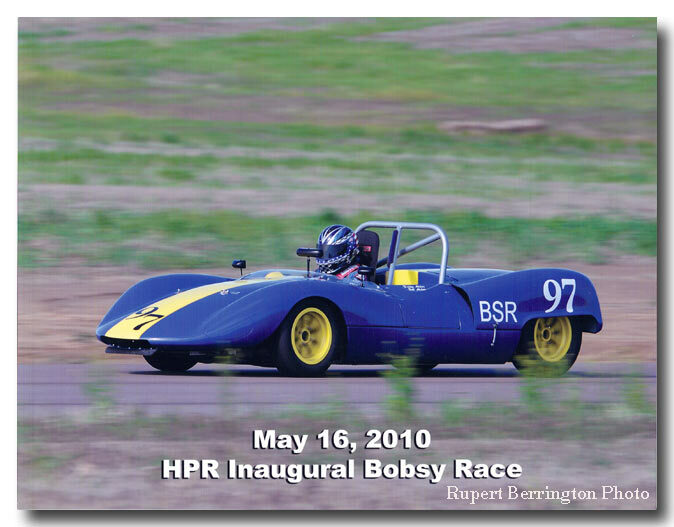 Also Bob ran the Alexis FB which hadn't been on track for almost two years due to a needed engine repair that took a back seat while the Bobsy restoration was in progress. This race weekend was also special because of an RMVR Formula B reunion with nine (count 'em 9!) 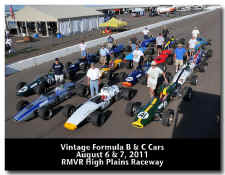 RMVR Formula B cars making the grid. That's the most FB cars we've seen in years, maybe ever. At left, Diane gets ready to take the Bobsy on its maiden voyage. 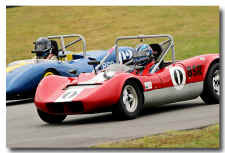 During the weekend Rupert Berrington got a great picture of the car on track at speed. 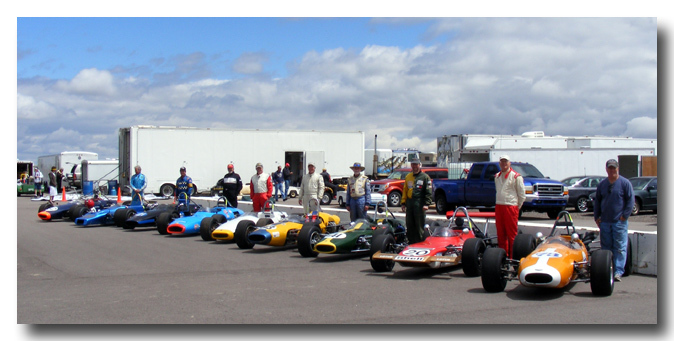 Below are some nice shots of the RMVR Formula B reunion in which the Team Terrific Alexis FB participated (fourth from right). 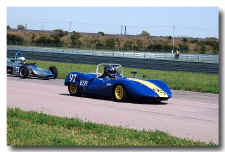 Picture at far right is another nice Rupert Berrington picture taken while on track and at speed. 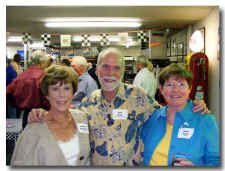 October 3-4, 2009Some neat photos of Diane at the last RMVR race, the Enduro. June 21-22, 2008 - I've not been real good about documenting our race trips lately. But our trip to the California Speedway in June was really neat. 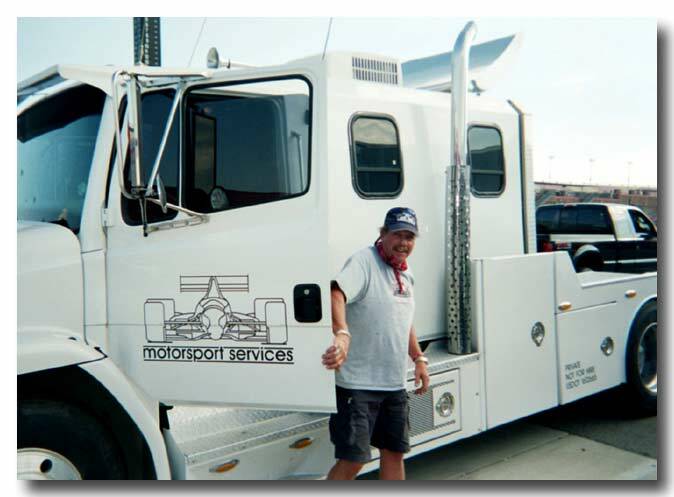 We were able to bum a ride for both of our cars in the very nice rig belonging to David Jacobs and Terry Hefty. Terry couldn't attend the event so there was room in the BIG rig for Diane and I. So, we were able to "fly-and-drive" and enjoy all the comforts of the rig (e.g. 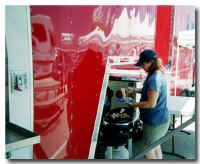 an air-conditioned toter-home RV) and the great hospitality of Tom and Kris Ellis who support David and Terry with their cars. 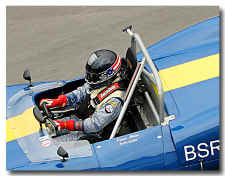 David only took one of his cars out to California -- his really nice BT-21 Brabham. 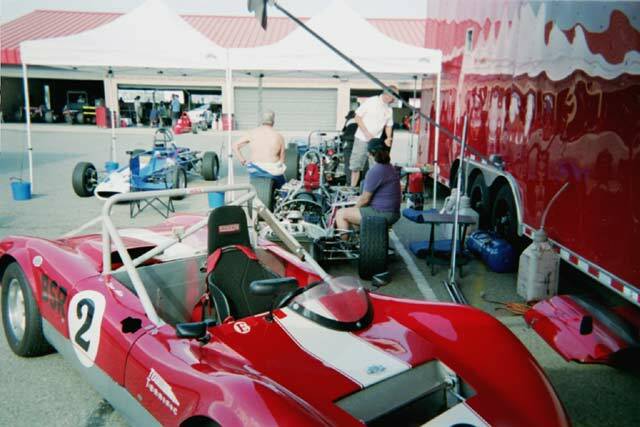 (Thus room in the rig for Team Terrific's two cars). His son Billy lives in northern California and was able to come down and drive the Brabham for the weekend. 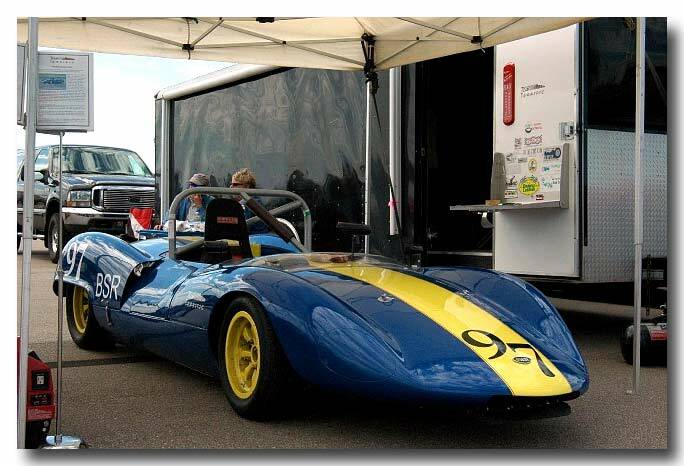 David's main mission for the weekend was to test and take delivery of his "new" Lola T-70 which was restored in California. As you can see below, the Lola T-70 is undoubtedly one of the most beautiful, if not THE MOST beautiful, race cars ever produced! But alas, there were some issues with the newly restored car and David had to leave it in California for the restorers to make it right. It will then be shipped to David in Boulder when finished. Diane and I had a great weekend in spite of what turned out to be one hell of a hot weekend. Temps of 105-110 degrees all three days. But we survived and actually had a great time. It's always neat to drive a new track and this one is special. This is a HUGE facility! While is a two-mile oval, the road circuit which we ran uses only half of the oval and then another mile of road racing track inside the oval. The high-banked portion of oval provides a very high speed unique racing experience. Overall it's a 2.8 mile track with over a mile of that run on the eastern half of the oval. Banking on the end of the oval is 18 degrees! 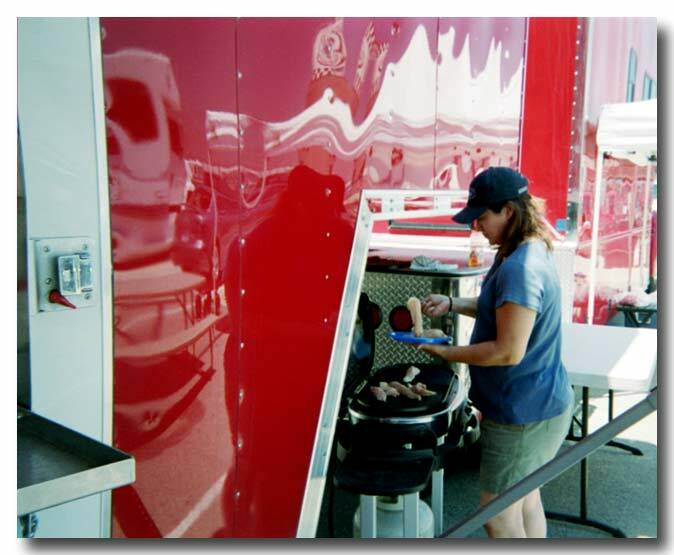 And we were cooking at about 120-125 mph sweeping around the oval portion. Cool. Our "home" away from home, the nice rig which includes an RV-like toter-home built onto the back of the tractor. And, air-conditioned too. 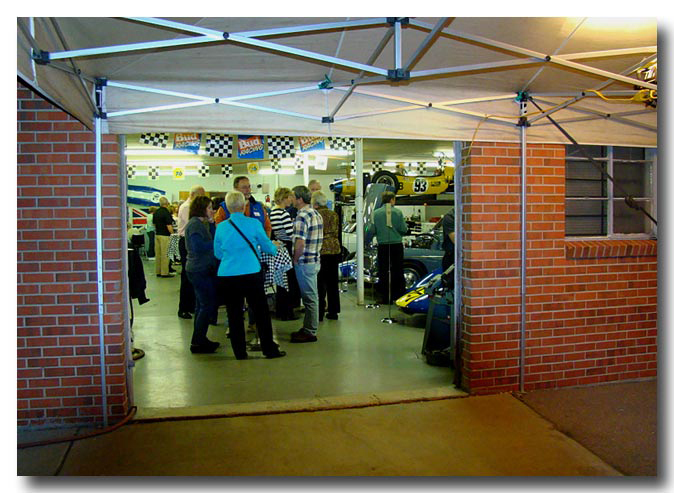 Our cars, the Brabham, and the Lola T-70 shaded and relatively cool. Temps of 105+ were commonplace for the entire three days. Diane relaxing between sessions.. Good buddy, Scott "Scooter" Meehan from Salt Lake CIty was also there. He too has a pretty darn nice rig. Kris took such good care of us, cooking up the nicest lunches. No track burgers for this crowd. The only way Diane and I would get to see the podium. You just can't show up and beat the home town boys on their home town track. But. . . we both put in a good showing. 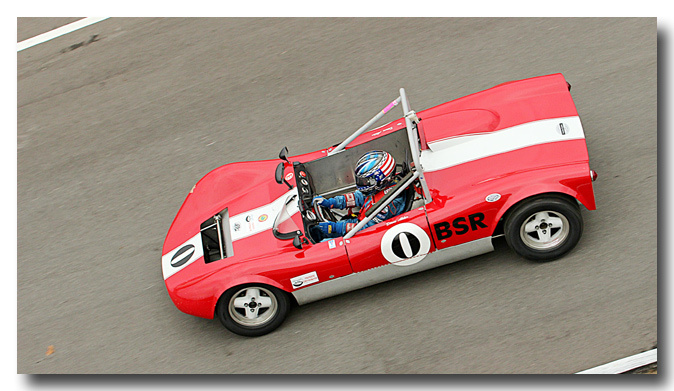 This is the stunningly beautiful Lola T-70. But due to a number of nagging teething problems, few good sessions were recorded during the three days of testing. Later in the weekend the crew of the restorer kept trying to find the problems, to no avail. Upon close inspection, David does have a scowl on his face. Bummer!!!!!! !